Eyal Spivak is shown in end of a week's mourning for his late son. He shows indifference to his neighbors since they purposefully avoided them when his son was near death. Him and his wife Vicky agrees to return to their routine, but instead Eyal chooses to go after a blanket they missed at the hospice and finds medical marijuana prescribed for his late son there. He smuggles it and decides to get high with the help of a young neighbor and bonds with him. Vicky asks him to book burial plots near their son, but he forgets and looses the plot. Eyal tries to get the plot and even attends the burial process of the person that is getting their plot and finds closure. Vicky who had a tough day gets emotional when she hears from Eyal that they have lost the plot. 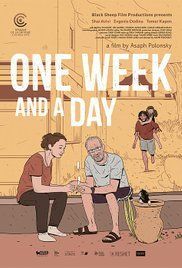 After the day Eyal sets out to change things in his life and consider living worth by starting to make his wife smile. Read more on Wikipedia.